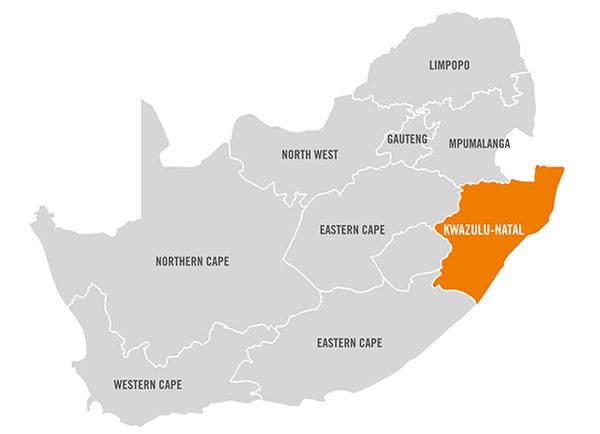 KwaZulu-Natal, as a strategically-located province of South Africa, is the gateway to the entire Southern African region. South Africa is a major industrial power positioned on the southern tip of the sub-continent, physically larger than the combined countries of Germany, France, Italy, Belgium and Holland. The Constitution of South Africa comprises national, provincial and local spheres of government that are both inter-dependent and inter-related. In terms of its constitution, the country is divided into nine self-governing provinces, each with its own legislature, premier and executive council members. The second largest provincial economy in the country, KwaZulu-Natal, is a coastal province and home to two of Africa’s largest and busiest seaports. Dube TradePort, home of the Greenfield King Shaka International Airport, is a catalyst for global trade and a portal between KwaZulu-Natal and the world. It is the only facility in Africa that brings together and international airport, a cargo terminal, warehousing, offices, a retail sector, hotels and an agricultural area. Located 30km north of Durban, Dube TradePort is positioned between the two largest sea ports in Southern Africa and linked to the rest of Africa by road and rail.